Front Street Cafe is honored to be spotlighted in the PBS Documentary about Philadelphia History and local Privy Diggers. In 2014 during the Construction of the new kitchen for Front Street Cafe at the south end of the property. Lee Larkin discovered an old Privy Pit. He and Adrian Montanez, with the oversight of local privy diggers Michael Frechette and John Freise, hand excavated the entire privy. 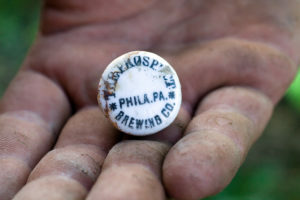 What they discovered was a window into Philadelphia history through the material culture of the former residents of homes long gone and forgotten. In the 18th and 19th centuries in Philadelphia, people did their “business” in the outhouse located in the yard or alley adjacent to their dwelling. Since there was no regular trash collection, they also used this outhouse to discard broken plates, bottles and all manner of refuse. As soon as modern sewers were installed to service each house, the outhouses were torn down and the brick-lined “privy pits” (often 30 feet deep) underneath them were filled in. Within a decade, in most cases, the location of the outhouse and its attendant privy pit would all but be forgotten. Enter THE PRIVY DIGGERS in 2016. These intrepid amateur archaeologists regularly are invited into peoples backyards to probe the soil, locate the underground structure of the privy itself, and begin digging. 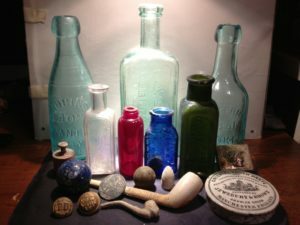 A single privy can hold broken and whole bottles and crockery, coins, pipes, toys and anything else that someone 100 to 200 years ago might have had in their pockets. Most interestingly, according to Michael Frechette, are the cast off’s from the things people did (other than their “business”) in these outhouses in private – things that are only rarely written about in Philadelphia history books. That is the draw for these diggers – getting to see the secrets of history that have lain buried there undisturbed for years. While the things they bring up may have a value on the open market, according to Tom Salvatore, if you divided how much they work by how much they make selling these artifacts, they wouldn’t be making more than minimum wage. And it’s not only see, but touch and smell. A vial of sassafras (an accepted 19th century remedy for arthritis) found 30 feet underground and held at arms length, after more than 100 years, still smells like, well, sassafras.